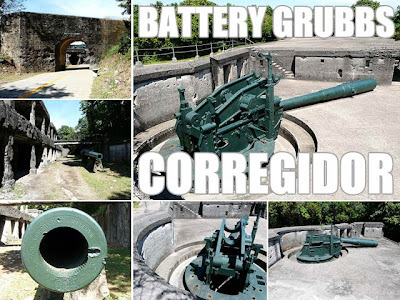 Battery Grubbs is another of Corregidor's heavy seacoast emplacements one will get to visit on the regular guided island tour. Work for this battery was done from 1907 to 1911 at a cost $212,397.86. It had two 10-inch disappearing guns making the battery the only battery with 10-inch gun emplacements in the Manila Harbor Defenses. These were 1895M1 guns on Model 1901 Disappearing Carriages (#25/#14 and #22/#16) and were apparently never changed during the battery service life. It was named in honor of 1st Lt. Hayden Y. Grubbs, 6th U.S. Infantry, who died during the Philippine-American War in 1899.